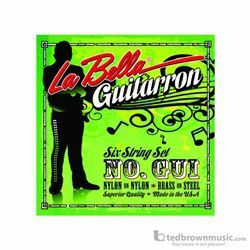 The guitarrone is a short-necked 6- string bass guitar used in Mexican "mariachi" music. Nylon wound on nylon trebles. Brass wound on steel basses. Loop ends.